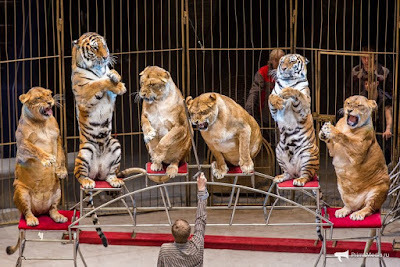 PETITIONS : Help Get These Old Circus Cats The Retirement They Deserve. He's known as the "Lion Whisperer" but some are calling him the animal abuser after footage of his obese circus lions and tigers went viral. Lion tamer Vitaly Smolyanets and his really, really big cats were part of the reopening of the Vladivostok Circus in Russia. 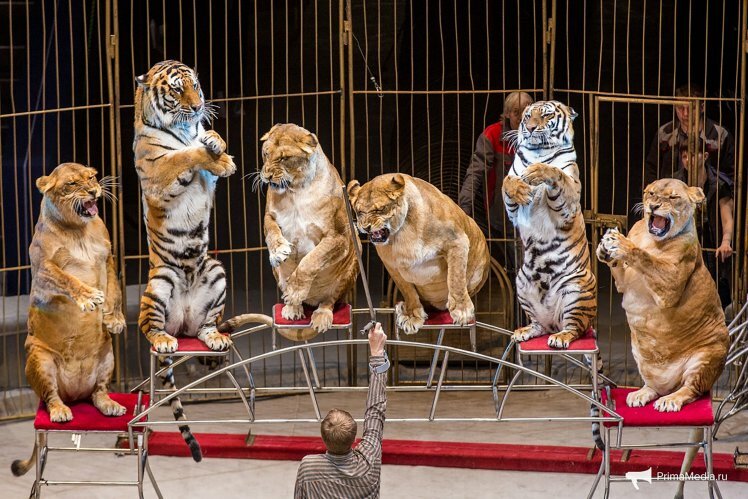 The three tigers and six lions were the main event and were supposed to wow circus-goers with their tricks. But what most people noticed was how extremely out of shape and unhealthy the cats looked. They looked more like fat house cats than ferocious predators. One commenter suggested: "It might be better to show them to a vet, not circus visitors." In his defense the Lion Whisperer said that the cats aren't unhealthy they are just old, saying: " "People put on weight as they get old, the same with animals." But there is a difference, people get to do what they want when they want. These cats don't. Instead, they are forced to perform for paying customers who think it's exciting to be up so close to such dangerous animals. In reality, it is just cruel. People also get to retire in their old age. These cats won't. That is unless we demand it. Tell the Lion Whisperer that it's time for him to retire his cats and send them to an animal sanctuary where they can live out the rest of their days in peace. Sign the petition and tell Mr. Smolyanets to end his big cat show.